Magnesium is one of the essential electrolytes present in that body. It plays a significant role in the physiologic processes occurring in maintaining man’s health and well-being. When the blood concentration of magnesium is decreased, this could result to certain pathological conditions. Magnesium has a crucial role in strengthening the muscles, so when a person lacks magnesium, he would experience muscle weakness. This could be easily treated by intake of magnesium. Vegetables and fruits are rich sources of this important electrolyte. Magnesium supplements, such as, vitamins could also prevent muscle weakness due to insufficient magnesium. Magnesium deficiency could also cause chronic fatigue syndrome. The person’s cellular function is compromised, so he feels tired and exhausted. It is similar to muscle weakness, only, this condition is within a longer period of time. Muscle spasms and cramps could also occur. Once the patient is treated with magnesium, the fatigue syndrome disappears. Persons who have low magnesium values often experience irritability and anxiety without valid reasons. He feels anxious, nervous and constantly worries about trivial things. Because of this anxiety, a person may not be able to sleep. He could experience insomnia, which could result to depression and more serious neurological conditions, such as seizures. Cardiovascular symptoms Magnesium takes part as a co-factor in some enzymatic reactions, and as such, its deficiency affects various organs, such as the heart and kidneys. Magnesium deficiency could cause irregular heartbeat or arrhythmia. High Blood pressure or hypertension could also result, together with headache and migraine. Coronary spasms could occur with lack of magnesium too. The heart needs electrolytes to be able to function well. These electrolytes (potassium and magnesium) help the cardiac muscles pump efficiently and properly. Without these vital minerals, the ability of the cardiac muscle to contract is compromised resulting to cardiac conditions. Constipation could result from magnesium deficiency because magnesium is crucial for proper metabolism and digestion of foods ingested by the body. With sufficient magnesium, food is broken down and metabolized to their simplest forms so that the body could utilize them efficiently to keep the body healthy. These are some of the symptoms of magnesium deficiency that people should be aware of. This knowledge could help them respond promptly to the onset of symptoms to maintain their health and wellness. The important thing to remember is that the treatment that works effectively in treating these conditions is the administration of magnesium to the patient. Magnesium deficiency can also be inter related to vitamin D deficiency. While magnesium can be derived from fruits, vegetables, and other food items. 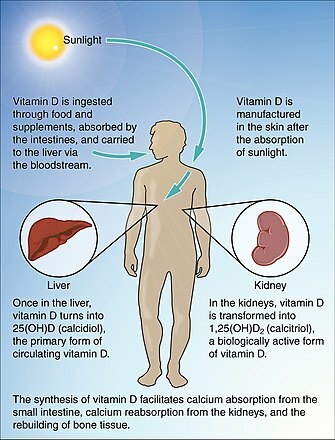 vitamin D is different, it’s mostly synthesized with the help of sunlight.